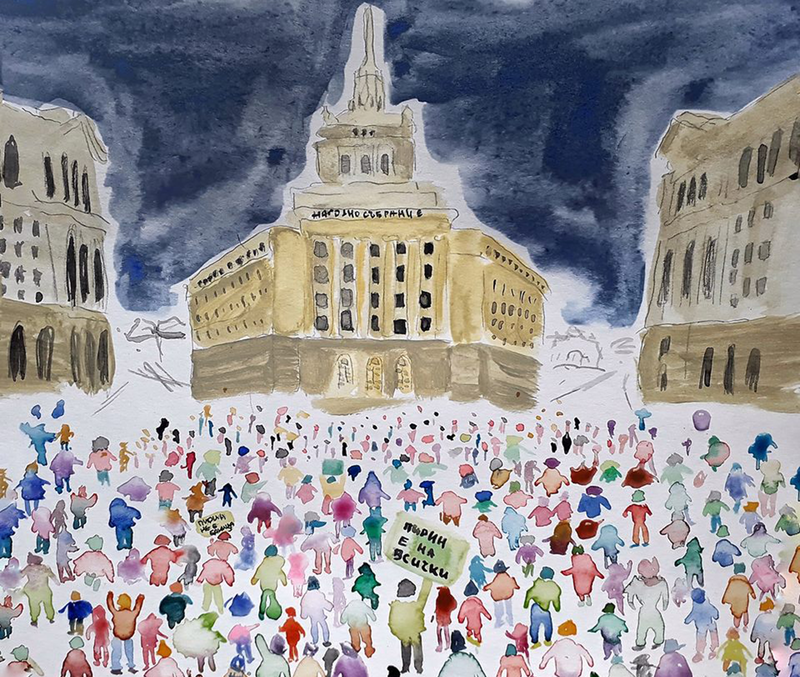 Illustration of the protest on 04 January, 2018, by Veronika Belcheva. With the transition to a Bulgarian-led EU Council, so too begins an urban protest movement in Sofia. The 11th of January, 2018, was the official start of the EU Council presidency in Bulgaria. As such, all initial meetings were held in the capital city, Sofia, in the National Palace of Culture (NDK) – a building which stands as a socialist monument from the 1980s. Thousands of people gathered near the NDK and started a peaceful march, shouting “We want nature, not concrete” while demanding the resignation of the Minister of Environment. This protest took place alongside marches in 15 other Bulgarian cities and two cities abroad – London and Brussels. For an observer in any of these 18 cities, it might be difficult to understand what is happening, or why, without checking a map for a mountain range in southwest Bulgaria – the Pirin National Park. Pirin National Park is a protected mountain range due to its unique forest, glacial lakes, and waterfalls. The park has been a UNESCO world heritage site since 1983, and it is also part of the European Natura 2000, as it supports the habitat for many birds and other rare species. Although it is protected on three scales – national, European and global – Pirin has been a victim of various speculations in the past: from corrupt local governments, organized crime within Bulgaria, and offshore profit-hungry businesses like the concessionaire ULEN that is operating the ski lift and the ski trails and that has operated beyond the law multiple times. Bansko, a town located in Pirin, is one of the contested spaces still undergoing transformation. Over the past two decades, Bansko has been one of the fastest growing towns in the country in terms of surface area and new construction. In turn, its identity and atmosphere has completed changed. What before was a small, cozy, even intimate town nestled in the mountains is nowadays a sprawling invader of the landscape. The regular tourists and even many of the locals have left. As a whole, Bulgaria had undergone many changes since 1989. Becoming part of the globalized world has gone hand in hand with privatization and speculation over land value and real estate. Small camping sites at the Black Sea coast, for example, or quiet mountain ranges that have been transformed into resort towns with more hotels than visitors. The experience of going to the sea, or of skiing, changed as well – it became a gesture of ostentation and upwardly mobile social status. At the same time, the disappearance of previously wild places sparked a reaction from both environmentalists and civil society. Protest in Sofia on 11 January, 2018. Photo source: protest organizers. At the end of 2017, the Council of Ministers in Bulgaria voted in favor of new management regulations that opened up 48% of Pirin’s territory for possible development and construction. The ski resort, which previously occupied 0,6% of the park, grew to 2,8%, with the idea of creating Bulgarian ski trails that could compete with the Austrian Alps. Furthermore, on the 11th of January, the government also voted for new regulations regarding development of the sea coast, threatening more Natura 2000 regions. Environmental organizations and civil society, outraged by these decisions, took to the streets of Sofia. Protests took place on the day of the Pirin decision, the 28th of December, 2017, and on the 4th, 11th, and 14th of January, 2018. Protesters voiced their disapproval not only of the development of Pirin but of development of the seaside as well. These places – non-urbanized and wild natural territories – turned into utopian places with symbolic meanings. The mental connection between the big city and places “without civilization” can be traced far back in time and still deeply impact social and political life in Sofia. Since the first touristic association in the country was established 1899, and with the increasingly rapid urbanization of the countryside, the rural became essential. Residents of Sofia have houses in villages around the country, they spend their holidays in the mountains or the seacoast, and so the places they visit have become part of their identity, connected with a broader social circle of other regular visitors. Civil society in Bulgaria is often seen as weak or underdeveloped due to its socialist past, and it is true that urban movements are rare. Still, the environmental movement since 1989 is a strong symbol of civil disobedience and collaborative power. Undoubtedly, the mountains and sea affect social and political contestations in Sofia. Urban social movements form around the idea of protecting clean and pure nature from the powers of urbanization and consumption. Throughout the 1990s and the beginning of the 2000s, protests concerning environmental issues were some of the few organized demonstrations in Sofia. Such movements often declare themselves as non-political, neither left nor right, and strong slogans are discouraged in order to avoid association with any particular party or ideology. Nonetheless, they inform the social-political life in the city. They give first-hand civil disobedience experience to countless people. They create space for political or at least open public debate. They also accommodate and incorporate various political views while causing turbulence in everyday urban life. The author at the protest in Sofia on 18 January, 2018. Photo courtesy of Fani Horn. 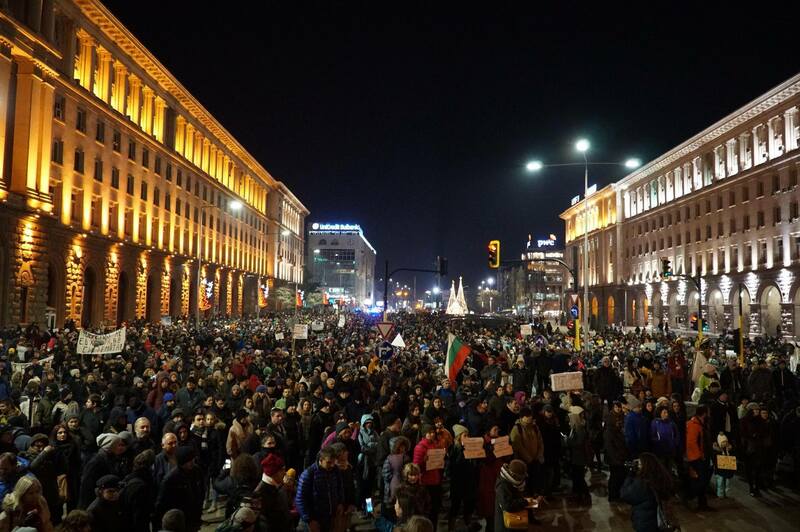 The January 11th protests, marked by the beginning of Bulgaria’s turn as EU Council leaders, gathered around 8000 protesters and ended in front of the National Palace of Culture, a clear sign that the protests are taking advantage of the presence of an international political body in order to mobilize a show of strength and visible resistance in Sofia. 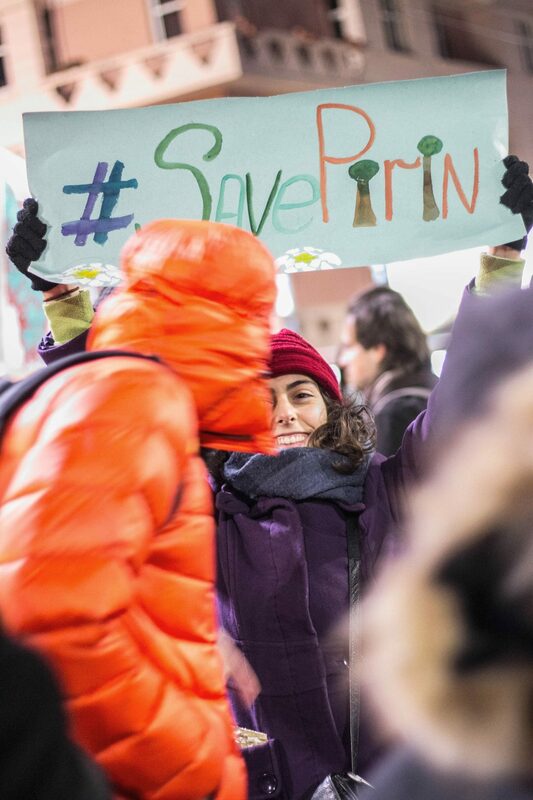 The movement #SavePirin started even before the decision of the Council of Ministers and used international channels and social media to raise awareness. The protesters aim to bring their message to all scales of government. Thus, the geographies of the mountain and the sea coast affect not only what is happening in Sofia, they are connecting Sofia with a wider world of cities. The same slogans were employed across 18 cities simultaneously. Bulgarians home and abroad were creating fluid connections between Sofia, Brussels, and London. With which protest more cities are involved. On the 18th of January the count was 19 Bulgarian cities and 10 abroad – adding Berlin, Vienna, Prague and Sydney as international allies. In the chaotic conflict between supporters and opposition, however, a superficial narrative of urban elites versus hardworking small town folk has developed around the small resort town of Bansko. The environmentalists in Sofia are supposedly confronting the residents and workers in Bansko, a narrative that distracts from the central issue of urban development. As geographer Jennifer Robinson suggests, we, as urban researchers, should consider any city as part of a broader world of cities. In the case of Sofia, today, we can speak of the city itself while also including its wider connection to the non-urbanized world. Wild, rural spaces become part of the urban landscape, and in turn symbolically charged as they become victim to globalization and urbanization. On the flipside, these very same rural spaces (both mountainous and seaside) become the crux for protests, which help to mobilize many people across multiple cities. The city and the country are often presented as separate entities, yet the threads that bind them together may be more numerous, and more fundamental, than is readily apparent.